This is the Ask Mellownest feature. If you have a question get in touch at info@mellownest and we might just be able to help. I’m hoping you can give me some advice. I’m at my wits end with my little boy. He just turned two in January and we are definitely having the terrible two’s. He’s always been strong-willed but now he’s having tantrums all the time and it’s really getting me down. I feel like we have a battle about everything and then he’ll just throw himself to the floor and scream for what feels like ages. I have no idea what to do when he does this as nothing seems to work. I’m getting to the point where I can’t face going to groups or see friends as I feel so embarrassed when he does this. All the other two-year-olds seem to be so much better behaved than mine. I would just really like to know how to handle them so it’s not taking over our whole lives. You have my sympathy, it sounds like things have been really hard work in your house for a while. When it comes to being able to handle toddler tantrums we have to account for normal cognitive development, temperament and your response to his big feelings. It’s developmentally appropriate for toddlers to begin to push the boundaries. This behaviour often coincides with huge leaps in their physical development. As they can walk, climb and grab better than they ever could before the world becomes much more exciting. Unfortunately, their ability to communicate their wishes and intentions isn’t as developed as their physical capacities. This often leads to a crabby toddler who can’t understand why you are trying to stop him doing something or trying to make him do something that he has no interest in doing, i.e. getting dressed. Once we begin to pay better attention to their attempts to let us know what they’re after we can respond more appropriately or offer them a slightly safer alternative. Due to their immature emotional and cognitive development, the toddler's brain can become easily overwhelmed. Toddlers and in fact all children benefit from a little careful management to prevent the situation getting to crisis point. At Mellownest we often talk about the emotional cup at our workshops and teach parents what to look out for and how to give your child a refill. Making sure your child has their physiological, balance and connection needs met in advance will go a long way towards preventing a meltdown. We have a full explanation and a FREE download in the link below. Some tantrums around this age are inevitable and actually, can be a valuable learning tool for your child and a connection point for your relationship. If your son learns that he can trust you with his biggest, scariest feelings it's going to make it much easier for him to communicate with you in the future. What can help us to handler toddler tantrums however is understanding our child's temperament. Some children are naturally more relaxed or more strong-willed. Some toddlers need to have lots of social interaction whereas others do better with some quiet time to themselves. Figuring out where your son lies on an emotional, sensory and physical activity scale might help you to plan his days better for success. It might be that you'd be better keeping your days flexible and low-key so that you don't feel under time pressure to get places in this difficult stage (although it's still important for you to have some social contact so perhaps consider whether you can build-in activities you can go to without your son). If you aren't sure, just play around with the balance of your days and observe your son closely, when is he calmer and happier? Take your cues from this and hopefully your daily life will become much easier. I’m getting the sense from your letter that you’re feeling pretty fed up with parenting at the moment and it’s become a little more of a chore. If you can, step back from the situation and take a look at your own feelings. Could there be times when you’re becoming hooked into power battles with your son? Now while there are certainly times when the adult needs to lead and set limits it also might help the situation if you were to loosen the reins a little. Offering your son directed choices about food, clothes and activities can go a long way towards reducing conflict. Just give him two different options and let him pick. If he doesn’t choose straight away leave the options there for a few minutes before trying again. Try to move away from insisting that he does as you would prefer straight away by giving lots of cues that something is going to happen. An example of this would be getting on your coat and bag a couple of minutes before you help him with his, all the while telling him where it is that you are going. An excited tone and facial expression will go a long way towards convincing him that your plan sounds fun. In fact, fun might just be the key thing to aim for more of. Often when we get trapped in a power struggle with our children one of the first things to disappear is our ability to be playful. Sing, make things a game, be silly and put his trousers on your head so he can laugh and tell you where they really go. We often forget as adults that children communicate far more by their behaviour than their spoken words and play is their preferred language. If we can learn to tap into our own playful side it's often a much better experience for everyone. Finally, what can you do in those moments when the tantrum hits? If you enter a state of flight or fight yourself you’ll find it hard to be calm and think clearly. 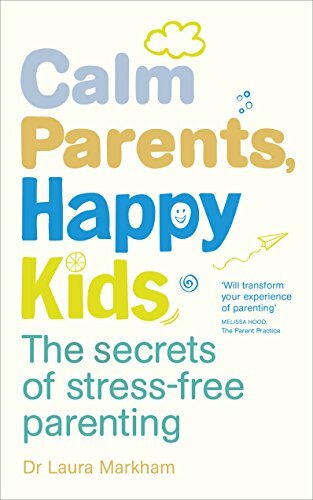 Psychologist Dr Laura Markham has some great insights into the challenges of staying calm in challenging parenting situation in her book, Calm Parents, Happy Kids. Packed with insight, practical strategies and scripts for managing all manner of parenting issues it's a book we recommend at every workshop. Take some deep breaths. It might help to remind yourself that tantrums are normal and that rather than doing this to annoy you, your son is having a hard time and feeling overwhelmed by his emotions. Try to avoid thinking of a tantrum as something ‘naughty’ that requires a punishment. Research shows that children who are given lots of support to manage big feelings when they're young actually grow up to be children who can self-regulate more successfully than peers who have had a more authoritarian style of parenting. Once you feel calm, make yourself available to your son by staying close by. Some children like to be picked up, other might lash out when they are in this state so use your judgement. The key is letting him lead the interaction so observe carefully for your son's cues. Simply keep your face and body language calm and open. Don’t try to communicate too much at this stage as any logic he does possess is certainly not in play now. Let him know that you’re there when he’s ready. And then wait. This might take five minutes or thirty-five but if there’s one thing I’ve learned as a parent it’s that you can’t really hurry a tantrum. If you do manage to shut it down it’s likely to erupt again a short time later (which is what I guess might have been happening for you and your son). Once the tantrum is over you can help your child to make a better choice or simple get on with your day. Remember a tantrum isn't personal, it's just a reflection of normal development, your son's temperament and how his day is going. What I can tell you is that as you practise this approach and the others above the tantrums are likely to become less frequent and lengthy as your son learns to trust that you’ll stay with him through these big feelings. More importantly, I hope that you will feel differently about his behaviour. Instead of feeling frustrated and embarrassed which blocks your natural empathy you’ll be able to meet him at his level and stay connected which is where the real parenting magic happens. Download the FREE mini-guide and checklist. Exactly what the emotional cup theory is and why it matters to YOUR child's tantrums. How real parents have used the theory for a happier family life. What your child's key tantrum triggers are. How to refill those little cups and have fewer tantrums!